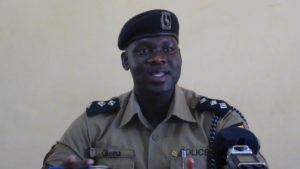 Aswa region police spokesperson Patrick Okema has advised parents to handle their differences amicably. Photo by Irene Abalo. GULU–Police on Saturday have arrested a 38-year-old man over allegedly hacking his wife to death with a hoe. The deceased was found in a pool of blood with a one-year-old child suckling her breasts. Abdul Rubangakene a resident of Airfield ward in Bardege Division, in Gulu Municipality, allegedly had a domestic brawl with his wife, Irene Lanyero, 25, on Thursday night that later resulted into violence leading to the latter’s death. Lanyero’s body was discovered by a concerned neighbour on Friday morning. The neighbor who preferred anonymity later informed police who rushed to the scene of crime, only to find the baby suckling the mother’s breasts. Rubangakene, a boda boda cyclist tried to hand himself over to police on Friday but changed his mind and fled police premises, according to a statement he recorded at Gulu Central Police Station where he is being held. Police arrested him on Saturday morning following a tip-off by locals in Lacor trading centre where he was reportedly spotted drinking in a local bar. Aswa region police spokesperson Patrick Jimmy Okema confirmed the arrest and said Rubangakene found in possession of suspected poison in his pockets. “We recovered a poisonous substance similar to ‘sibacle,’ commonly referred to as rat poison. We think he wanted to drink and gain enough courage to commit suicide,” Okema said. He said a charge of murder has been preferred against Rubangakene and his file forwarded to the State Attorney for sanctioning. Meanwhile, Watoto baby’s home, a Christian orphanage in Gulu, has taken over the responsibility of caring for the one-year-old child. Okema advised parents to handle their differences amicably to avoid ruining the future of their children. Gulu Gender office receives about five cases of domestic violence daily with the figure going higher during beginning of school term when parents are expected to provide for their children as they return to school.